Krista G. asked a good question in comments yesterday: How do you know when you're ready for beta readers, and how many of those drafts did you go through before you reached that point? I realized Beta isn't talked about in too much detail, so I thought I'd use my long-winded skills to cover everything I can possibly think of about this thing called Beta. Because really, Beta isn't exactly the easiest thing. It can be a very trying period for a writer. Definition according to me: Beta is when a writer sends his or her work to readers for feedback, and then takes that feedback to improve their work. First, you have to get your manuscript to a place where you think it's "ready" for readers. I wouldn't say you have to think your MS is perfect—then what would be the point of Betas? But it should be something you'd feel comfortable showing someone. It should be your best effort. For me, that point is usually when I'm thinking, "This is pretty good, but in my gut I know there are a few issues I'm missing. I don't know what they are, so I need help seeing them." Usually I'm on about my second or third draft when I'm ready for Beta readers. I do mine in several phases, as you'll see, so that might be early to some people. Everyone is different, and it's good to find a process that works for you. It took me a few books to figure out who was most helpful to me and when I should send things out. Okay, so you've decided it's time for Beta! Who do you send it to? Many of you know I'm a huge proponent of Alpha Readers. They aren't for everyone, but they are a huge help for me when I'm shaping my first draft. They are supportive, which helps me to move forward. Yet they are also honest, which helps me plan out my story and make it the best I can on the first round. I ask them for input first, and they help me shape the book pre-Beta. Then I send it to my crit group. Don't have one? This is my guide for finding one. But here's the thing—I don't send it to all my gals at once. I pick two at a time. Reason 1: Too many cooks in the kitchen can get overwhelming fast. You don't need 20 people to make you think differently about your book, and when you get that many betas who are you going to listen to? Reason 2: Then I can save my other Betas for the next revision, instead of forcing them to read it again. Reason 3: When I send it to the next round of Betas, I can easily see if I fixed the issues from last round. If they don't bring up "that one plot hole," then likely it's been fixed. Revision success! Now, your Betas have sent you their feedback! You read their comments...and then you panic about how in the world you're going to fix your stupid book. Why did you ever write it in the first place? How did you not see that massive plot hole? The untrue character development? The pointlessness of that scene? Wait...what? You guys don't panic about that stuff? Well, I do. Humor me here. Yes, even with two Betas I get overwhelmed by all the things they bring up in my work. I have really good Betas, let me tell you. To curb the freak out, I plan. I think about what they said and why they said it. I decide if their suggestion merits a substantial change, or if I just wasn't clear and I need to tweak wording. I do not, under any circumstances, touch the book. It took me a while to figure this out, but I've learned Betas are for getting you to look at your book from a different viewpoint. You don't have to take their suggestions. Sometimes you shouldn't, even. But you should think about what you want to change to make things clearer. That takes a little bit of time. Stupid time, like we need to wait more, right? But I promise it's worth it. Once I decide what I want to change, then I run it by my Betas to see if that would quell their concerns. Usually they approve, and if they don't they explain to me more of what they had issues with. And I think more. I highlight the change once I've entered it, just so I feel like I'm making progress. 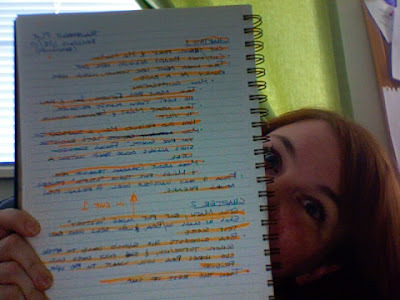 Editing feels very stale to me in comparison to creating, so this helps me a lot in revisions. I even do it when line editing. I don't look at my Betas' comments until after I've done the revision. Then I take another glance to see if there is anything else I want to apply. After that, I pick two more Betas and repeat the process. And repeat and repeat. I think the biggest thing I've learned about Beta is that it's not just one round. It's a long-term process of improvement. I would strongly recommend going through several rounds. Like at least three. I know it can get exciting to get your work out there to agents, but it's amazing what you can learn by spending time in Beta land and really thinking about your book. I heard this rumor that one of your alpha readers is BLISTERINGLY HOT, and that's the only reason you use her, because in reality she's kind of useless. Other than that, "except, you know, not backwards" tee hee hee hee. Also maybe I should sleep more. The rumors are true. Well, either that or she's painfully ugly. I'll never know, whenever I look at her my eyes blister over. Must be some sort of freakish natural defense mechanism. I heard they were going to feature her on National Geographic, but the workers' comp claims were too high due to all the eye blisterage going on. "I think the biggest thing I've learned about Beta is that it's not just one round. It's a long-term process of improvement." Such a true statement. I like your approach to alpha and beta readers! I think the biggest thing I've learned about Beta is that it's not just one round. It's a long-term process of improvement. I will definitely try to have more than one round of Beta. Thank you for the awesome post! I've seen a lot of posts on beta readers and crit groups, but this one is by far my favorite. It tells it all. Thank you! I recently learned this for myself. Too many betas and you just don't know what you need to work on. If they all have something different that seems to be a problem, you feel like you just need to throw out the whole thing and never look at it again. I like the idea of just two or three betas at a time and doing it like shampoo... lather, rinse, repeat. My husband is always my alpha. And the best sounding board for everything else. Kiersten, you were taking the words right out of my mouth, up until you said her(instead of him)! But anyway, as the less useful of the alpha readers I always love that first read through! It's like I get to read a book for free. I always tell Natalie thanks for writing me books. Because they are totally for me. Another useful and insightful post. Thanks. Great advice! The thought of having betas both excites and terrifies me. But this approach definitely helps. Well said, my friend. And why am I not surprised that you use an orange highlighter? It's like your reading my mind (and others', perhaps) lately, Natalie! I do think about my future Betas now and then, so this is an excellent post to get me thinking more concretely about how they go. You offer such wonderful advice in your blog and I thank you. I posted a link to your post about how to find a crit group on the Utah Children's Writers blog. I hope that's OK. Okay, no, but really, great post. I completely agree that you should spread out your betas through several drafts. Quick question...do you send your betas hard copy or efiles? My question in response to this is where you get all your betas? Are all of them in your crit group? Have you ever had to discard a beta? I need to get me some betas. Or maybe some alphas. Great post! Whew, go away to write and look at all those comments/questions! Brandon, no direct mmorpg beta experience here. But my husband has been in on some. Dreamstate, I have never sent hard copies anywhere. I'm all digital here. I use Word's track changes feature. LT, see that link about my guide to crit groups. Thanks for taking the time to answer my question in such a detailed, thoughtful way, Natalie. Very helpful! Great post. My WIP is with a beta right now. The feedback is undeniably the best you can get. Just have to say that I cracked up reading the comments tonight to see your husband's profile pic. Kakashi from Naruto? My husband got me hooked on that and we are watching all of the episodes online right now. I knew there was a reason I liked you. Word verification... rewoo. Does this mean you have to all ready have been wooed? I never really considered Alpha readers. I'd known about betas but not alphas. I went back and read your post about them and I think that may be exactly what I need to help me bounce off ideas to get through this painful draft of mine. Natalie--What is the difference between a Beta Reader, an Alpha, and a critiquer? I'm gonna take a stab at this one, Sharon - but feel free to correct me, anyone, if I get this wrong. Beta readers are the people who read your manuscript once it's in pretty decent shape (you think). As Natalie mentioned in this post, she passes her books off to Betas when she's gotten to the point where there's nothing more she can think to do. Betas help you see your manuscript from another perspective, since you're so used to seeing it from yours. Critiquer, I would say, is just a catch-all term for anyone who gives you feedback on your work. Critique GROUPS are a little different - that phrase means different things to different people, but the way Natalie usually uses it, your critique group is just your collection of Betas. OK, cool. I was doing this stuff kind of instinctually already, it turns out. Including sending to beta readers 2 at a time and then using each new round to make sure previous problems had been fixed. It was really cool to get feedback from a second-round beta reader who gave me some pretty intense insight on problem areas. She didn't even mention the main, HUGE problem area I'd had the first time around, which meant, to me, that I'd solved the problem. Glad to know I've been doing something right. And thanks again. This reference stuff is seriously great.